1. In medium bowl, flake tuna with fork. Stir in onion, basil, chives, oil, lemon juice, vinegar, salt and pepper. Fold in beans and tomato. 2. Divide greens over 4 individual plates. Cut avocados in half; remove pits and remove avocado flesh from skin using a large spoon. Place 1 avocado half over greens on each plate. 3. 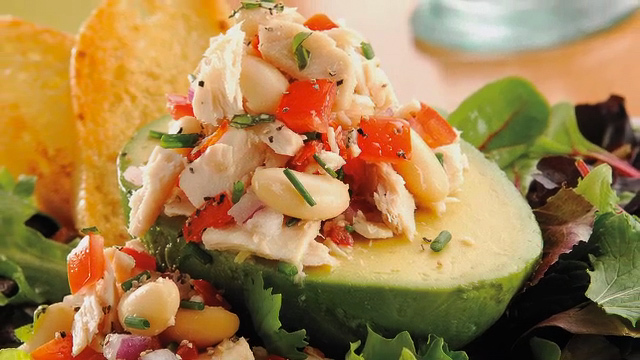 Spoon tuna mixture into avocado halves on each plate and serve with baguette toasts. Avocados are an excellent source of mono and polyunsaturated fats that may help lower LDL cholesterol. Plus they contain over 20 vitamins.